ALVI Technologies is distributing the Knick range of IsoAmp 23000/24000 isolation amplifiers. The isolation amplifiers are designed for conversion of shunt voltages to impressed ±20mA or ±10V signals. 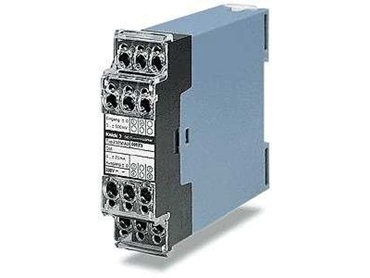 The inputs can be in the range of ±500mV and working voltages of 2000/1000Vdc input/output. Insufficient isolation and common mode rejection leave an electrical system susceptible to high voltages at the operating site. These voltages can cause substantial measuring errors that could lead to unwanted shutdown of whole sections of the system. These dc isolation amplifiers have been designed for measurement on low-resistance signal sources. Common mode interferences and interferences from phase control are suppressed effectively. The isolators provide safe and high isolation from the input to the output and to the power supply. They are tested to 7kVac. They are housed in 22.5mm wide modular cases and come with 230Vac,115Vac or 24Vac/dc power supplies. A specially developed chopper circuit allows these isolators to have extraordinary values for long term stability, transmission accuracy and disruptive strength. Their high zero stability and excellent linearity make them ideally suited to both ac and dc applications up to 5Hz.